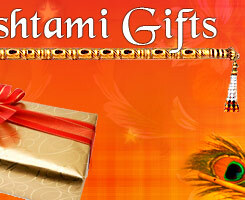 Janmashtami, celebrating the birth of Lord Krishna, is one of the most sacred Indian festivals. Scroll down and read a brief history of Janmashtami. The festival of Janmashtami, or Krishna Janmashtami, celebrates the birth of Lord Krishna, one of the incarnations of God Vishnu. The festival falls on the Ashtami tithi, the eighth day of Krishna Paksha, of the Hindu month of Shraavan which corresponds to the period between mid-august to mid-September of the Gregorian calendar. For Hindus, the life of Krishna exemplifies morality and virtuousness. Some historians have surmised 3227 BC to be the year of birth of Lord Krishna. It was prophesied that the eighth son Of Devaki and Vasudeva will kill the demon king Kamsa. Upon hearing the divine proclamation, Kamsa imprisoned his sister Devaki and her husband Vasudeva. Krishna, the much awaited eighth son of Devaki, who was to free the earth from all demons, was born in prison at the stroke of midnight. Though, Kamsa succeeded in killing all the previous seven children of Devaki and Vasudeva, Krishna was saved by divine intervention. 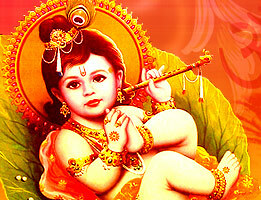 There are several legends associated with childhood of Krishna. In his adolescence, Krishna killed Kamsa and liberated the people of Mathura from a cruel and tyrannical king and established a peaceful and prosperous kingdom. During the Mahabharata war between the Kauravas and the Pandavas, Krishna acted as the charioteer of Arjuna, one of the Pandavas. While delivering his discourse to Arjun, which has been compiled in the sacred Hindu Scripture of 'Bhagwat Gita', he spread the concept of karma and divinity to the entire human race. In one of the verses Krishna says, "Whenever there is decay of righteousness, O! Bharata and a rise of unrighteousness, then I will manifest myself." Hindus still believe that, Lord Krishna will be born again to banish all that is evil and profane and will thus re-establish the religious sanctity. Hindus, since ages, have been celebrating the birth of their great savior, Lord Krishna on the occasion of Janmashtami, with great devotion and ardor. Celebrated all across India, the festival of Janmashtami bears a special significance in Indian culture and is marked for the inspirited festivities. If you wish to make this pious occasion of Janmashtami special and memorable for your loved ones, send a wonderful gift bearing all your love and hearty wishes.